You will be very comfortable at Badger Cottage with all the conveniences of home plus abundant charm and surrounded by nature. The king size bed in the loft looks out to the gorgeous view of the mountains and there is a convenient toilet tucked away under eaves and a lavatory. The living space also has huge views, an extra single bed, a wood stove, satellite TV and cable internet. The dishwasher and fridge are scaled to the space and there is a 5 burner stove with convection oven. A full bathroom with soaking tub is on the main level The utility room provides for lots of additional storage and washer and dryer. A large coat closet in the entry has plenty of room for boots and skis can be stored just outside. Right outside the door is a trail taking you on a scenic 1 mile loop that connects to a large network of trails. You and your dogs will love the walks, or you can snowshoe or x-c ski. Just over the Stowe-Waterbury town line with easy access to the Village of Stowe, the ski trails of Mt Mansfield and I-89 makes this an ideal location. Get away with your favorite person and four legged friends for the weekend, week or longer. Owners live on the 18 acre property and are available 24/7. My husband, Frits and I built this cottage from an old barn that we rescued. This was our home while building our new house just completed in October 2013. We lived here with our two dogs very comfortably for 21/2 years and now want to share it with our guests. Frits is a builder who can manage any building or repair job and I am an active real estate broker. Prior to building this new house we lived in Stowe for 35 years. We are available to our guests around the clock should you need anything. Whether you are a couple who love nature and the outdoors or just like to curl up next to the wood stove with a good book, you will enjoy this beautiful setting and charming cottage. Natural ledges, huge rock formations and gorgeous southerly views attracted us to this 18 acre parcel of land surrounded by larger conserved acreage. Building here was a challenge but well worth the effort. We love the convenience of being on the south side of Stowe for easy access to Burlington and the airport yet tucked away in our own private place to enjoy the birds and animals that reside here with us. toilet, Toilet under the eaves for shorter people. This was our second visit and it was great yet again. We will be back as soon as we can! Already dreaming of returning to this charming place again. The cabin was perfectly laid out, very clean and comfortable. Amazing mountain views and great hiking and skiing easily accessible. We really appreciated being able to bring our dog along too. The hosts were helpful but not intrusive. This sweet little cabin was so warm and cozy. The view was amazing and the location was perfect. Everything you needed and the owners checked in and said goodbye but kept to themselves in between. We will def be back again. 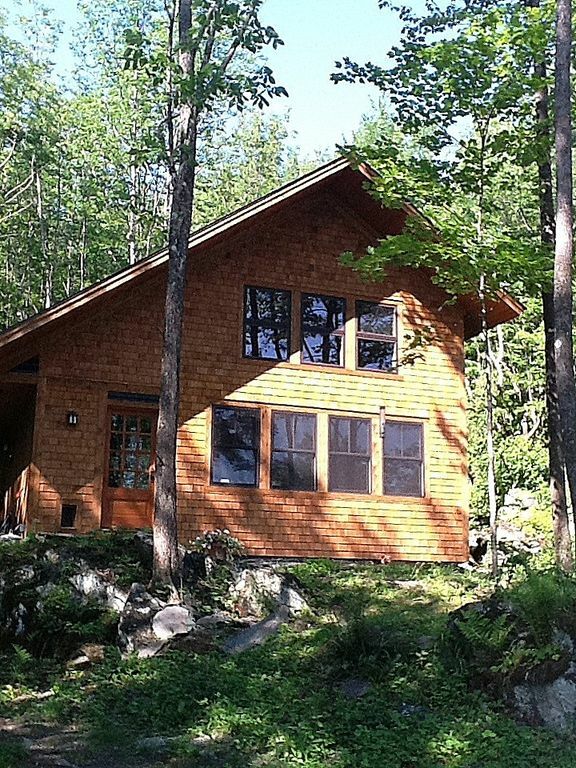 Very warm and inviting cabin that is close to town and all winter activities. My Son and I enjoyed our annual Father Son Ski/Snowboard trip at Stowe this year. We didn't get to Ski but one day due to an incredible cold spell with sub zero temps, so we hung around, played games, watched a few movies and had our time to catch up all while feeling very much at home. This was a great setting with comfortable furnishings and very clean! We didn't get to meet the owners due a late arrival, who live on property, but they said hello from across the road the morning after our arrival, and allowed us our privacy the rest of the trip. Our second time at the cottage. Once again a perfect experience. We'll be back again. We absolutely loved our visit in Vermont at Badger Cottage. Frits and Cubby are the ultimate hosts. We had everything we needed. Quiet and comfortable. Beautiful hiking/snowshoe trails right there. When it says dog friendly they mean it. Dog bed, bowls, balls. Plenty of property to get exercise. Our dogs didn’t want to leave and we didn’t either. Cannot wait to return! Scenic wooded area with walking and x-country skiing trails. Close to the ski trails of Mt Mansfield and Stowe Village. Just 1/2 mile off Route 100 between Stowe and Waterbury Center.